The PayPal Express Checkout button gives your buyers another way to pay, and it complements your existing Payflow payment solution. Online shoppers appreciate the convenience and security of PayPal, where they can pay with their PayPal balance, bank account or credit card without sharing or entering any information on the merchant’s site. To use this service, merchants must have a merchant/business account with PayPal. PayPal also provides a Sandbox environment to test your integration end-to-end. The new enhanced Express Checkout flow provides a simplified checkout experience that replaces the classic Express Checkout full page redirect flow. On desktops, the PayPal payment flow takes place in a secure window that opens in front of the merchant website, while on small-screen devices (tablets and smartphones) the PayPal payment screens are optimized for full-page mode. Express Checkout flow offers a streamlined checkout flow that keeps customers local to your website throughout the payment authorization process. 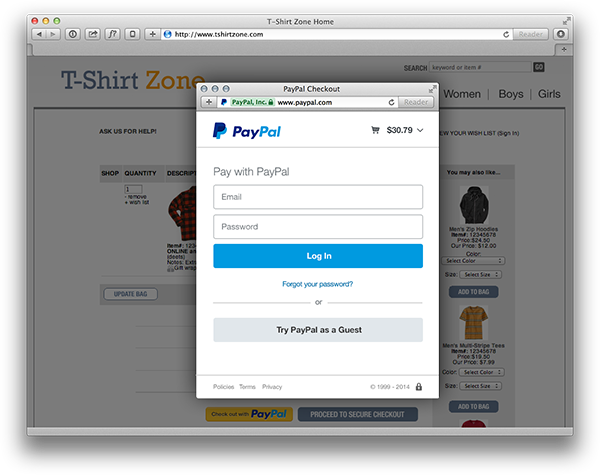 The redesigned checkout experience presents PayPal screens in a secure overlay window that sits atop your webpage, providing a more natural and user-friendly checkout experience. The buyer chooses to checkout with PayPal and clicks on the button. The buyer logs in to PayPal in a secure window that overlays your website. The buyer also authorizes the payment in the secure window. PayPal returns the buyer to your website to review the charges and transaction details on your confirmation page. You can make a GetExpressCheckoutDetails API call to get the details you display on this confirmation page. The confirmation page should have a confirm payment button that triggers the DoExpressCheckoutPayment API call. The transaction is now completed. Set up a basic integration. Set up other transactions — includes authorization and capture, refunds and voids.